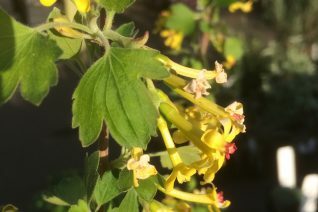 Curious low, evergreen, winter blooming shrub that erupts in 3″ long pale, ghost green flowers from January to March. To just 2′ tall and spreading twice as wide its large rubbery, dark evergreen leaves are a great backdrop to the flowers. Just as nice the leaf petioles are a dramatic madder red. Rich, well drained soil with regular summer moisture. Part shade to high overhead shade. Excellent combined with Hellebores, Cardamine, Cyclamen coum- which all desire the same cultural requirements. Strongly horizontal habit. Blooms on wood from the previous year prune (very lightly) if needed after flowering has ended. Moderate deer resistance. AKA Laurel Leaf Currant. Wonderful on shady hillsides where it lights the winter months. 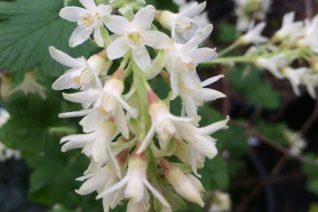 Excellent improved form of the already popular white flowered Flowering Currant. This form sports foliage that is deeply divided- very pretty- and a more dense and compact habit. Its an incredibly heavy blooming form that has great garden application. To 4′ x 5′ in 7 years with a rounded mounded habit. In late February- April pendant clusters of pure white flowers glow in the early spring sunlight. The buds emerge chartreuse and then become pure sparkling white. This was bred and selected at OSU. And so far has been rare on the market. Full sun to quite a bit of shade with light consistent summer water to establish. Then- it can survive on all that falls from the sky. Takes light irrigation in gardens but never soggy and never soggy during hot weather. Fall color is yellow/orange and brief. Sour fruits are dusky blue in summer. Moderate deer resistance. Derivative of an Oregon native plant. PPAF. This form of the famous eastern U.S. clove currant is fabulous not only because it is resistant to White Pine Blister Rust – and won’t transmit it to those trees- it bears large black, sweet edible fruit in summer. The chains of yellow flowers in March/April emit the adored fragrance of powerful cloves. Detectable quite a way away. To 4′ x 3′ in 5 years. Full sun to shade in rich to average well drained soil. Light summer water. Very adaptable and extremely hardy to cold. Fall color in our climate is yellow to orange. Self fertile. Protect fruit from birds. They really are a good quality black currant. 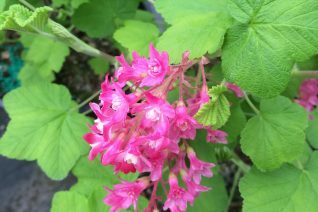 Really excellent form of Chaparral Currant with 3″ soft pink flowers that appear at any point during winter well into spring. An evergreen shrub to 8′ x 5′ in 7 years. Full sun to part shade and well drained average soil. Great on a slope. Loved by overwintering Anna’s hummingbirds. Flowers are surprisingly cold hardy and are undamaged to the upper teens. If those that are open are spoiled by frost more will follow after the thaw. Very very drought tolerant, No supplemental water required when established. 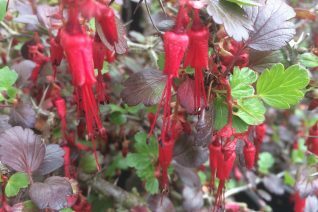 Grows fairly quickly and is never a dense shrub- all the better to see the pendant flowers. Dry borders, shrub borders, winter gardens. This native of the California mountains loves our climate as well and is supremely adapted to a winter wet/summer dry regime. Moderate deer resistance. Excellent winter blooming shrub. A beacon to Anna’s Hummingbirds. One of the most spectacular of the flowering currants. 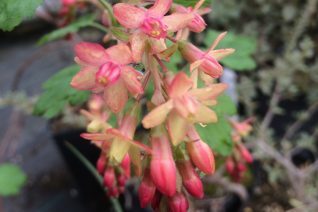 This hybrid between the yellow eastern Ribes odoratum and our locally native pink flowered western Ribes sanguineum splits the good looks with chains of coral orange flowers with a faint yellow center. Salmon up close the color reads as orange from farther away. 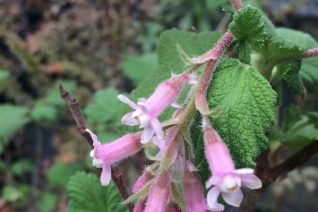 Blooms March/April for weeks on a large spreading shrub for part shade and rich, well drained soil. Consistent summer moisture- do not let it dry completely nor should it ever be soggy. Extremely cold hardy with orange/yellow fall color. To 8′ x 8′ in 8 years. Blooms on wood from the previous year- prune AFTER flowering if needed. 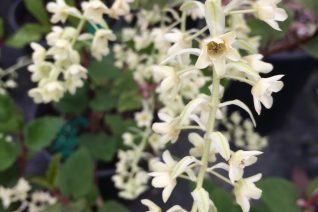 As luck would have it this lime/chartreuse foliaged variant of our locally native and cherished flowering currant appeared at our nursery. We’ve grown it for years now and it is so much tougher and more reliable than the closely related R. s. ‘Brocklebankii’. Hot pink flowers contrast in a great way with the lime colored vivid foliage. To 8′ tall and 4′ wide in 7 years. Part shade and regular water to establish the first year then none in subsequent years. Adaptable to many types of soils. Will not burn in full sun but isn’t as happy. Add pep to wild areas. Brighten up shady environs. Blue,very sour fruits appear in early summer. Oregon native plant.